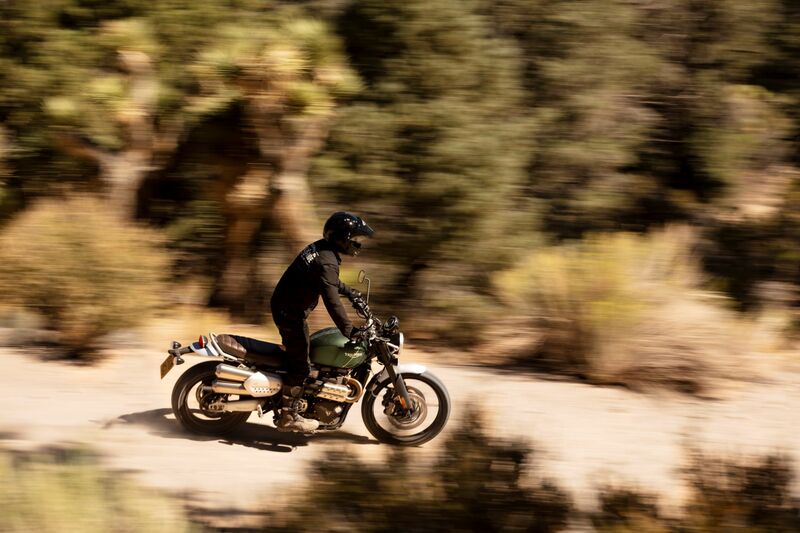 Topline: The Bonneville-based Scrambler gets two distinct variants, both with off-road character. The XC is designed for “all-road versatility” and the XE delivers “effortless off-road capability.” They're quite a pair. 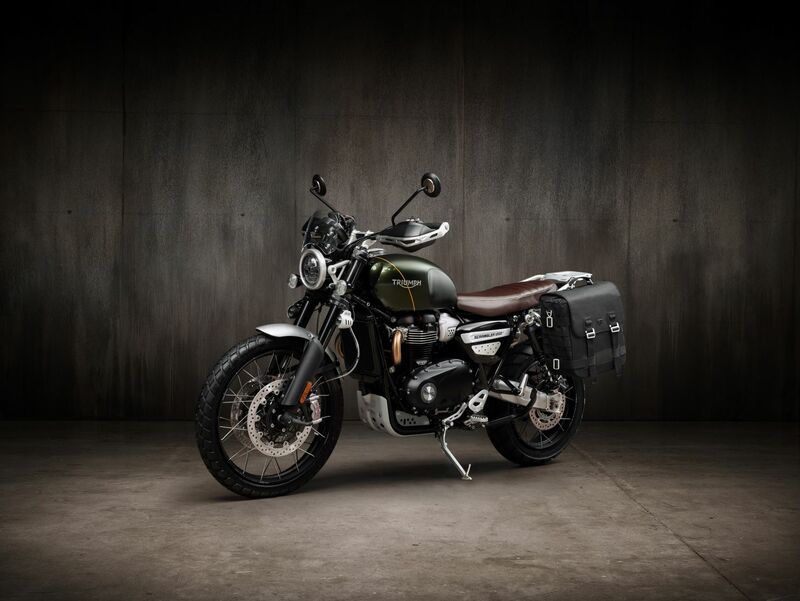 What’s New: The Triumph Scrambler 1200 is all-new for 2019 and it’s much more than just a Bonneville with knobby tires or a Street Scrambler with a bigger engine. Where to begin? Let’s start with the basics. The new Scrambler shares its DNA with the wonderful Triumph Bonneville T120. 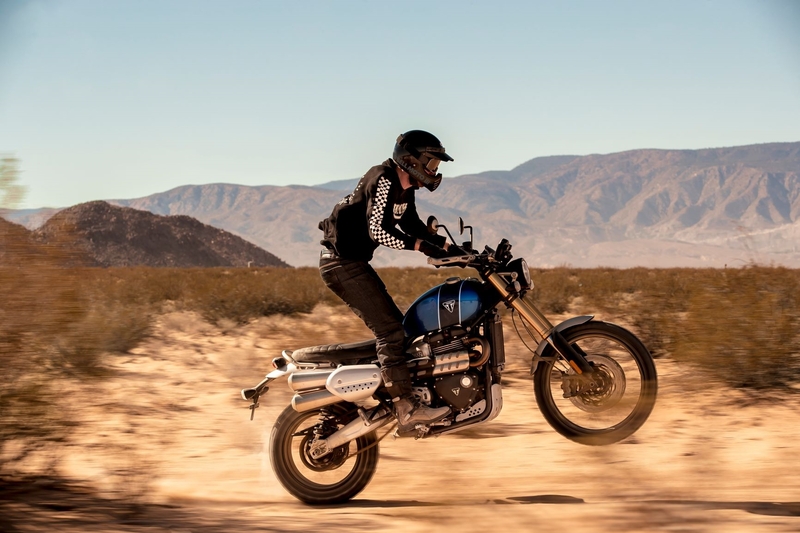 The two bikes have the same 1200cc parallel twin engine, but the Scrambler 1200 has a dedicated tune rated at 89 horsepower and 81 pound-feet of torque, a 12.5 percent power bump over the T120. In classic Triumph fashion, it has the look of an old-school, 1960s bike with some modern flair, the most distinguishing feature being its tall, straight exhaust pipes that look like they’ve been carefully designed to avoid burning the rider’s right leg. So, what’s the difference between the XC and XE models? 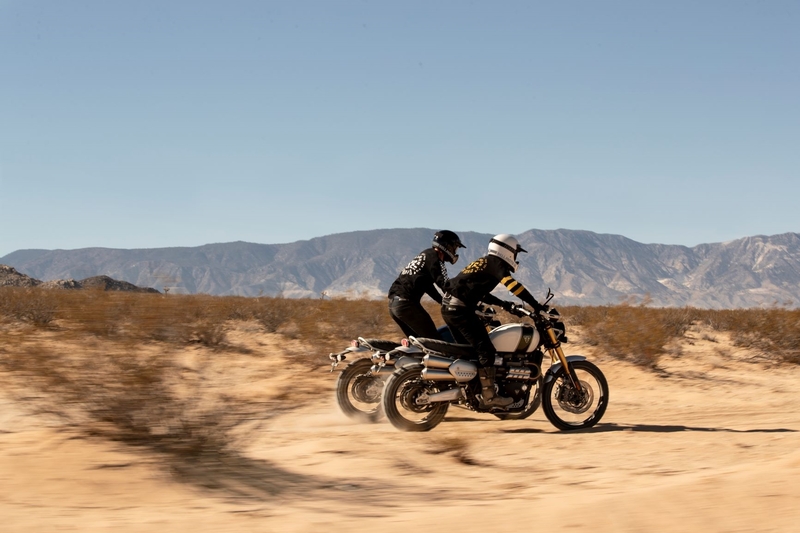 Triumph is doing something similar here to what it does with the Tiger adventure bike, making one model that’s more street-friendly and another that’s a more serious off-roader. The XC is the base model that’s being marketed as the more versatile all-rounder while the XE is for the serious off-road stuff. That’s a lot of exclusives. But the XC is no slouch, and there’s plenty of cool stuff that comes standard on both Scrambler 1200 models. They both have Brembo brakes with twin discs in front, Showa front cartridge forks, Öhlins adjustable rear suspension, spoked wheels with tubeless tires (21” in front) which Triumph says is an industry first, and an adjustable handlebar position. There’s also a lot of standard tech on every Scrambler 1200 that you might be surprised to find on such a simple-looking bike. It’s ride-by-wire with ABS and switchable traction control. 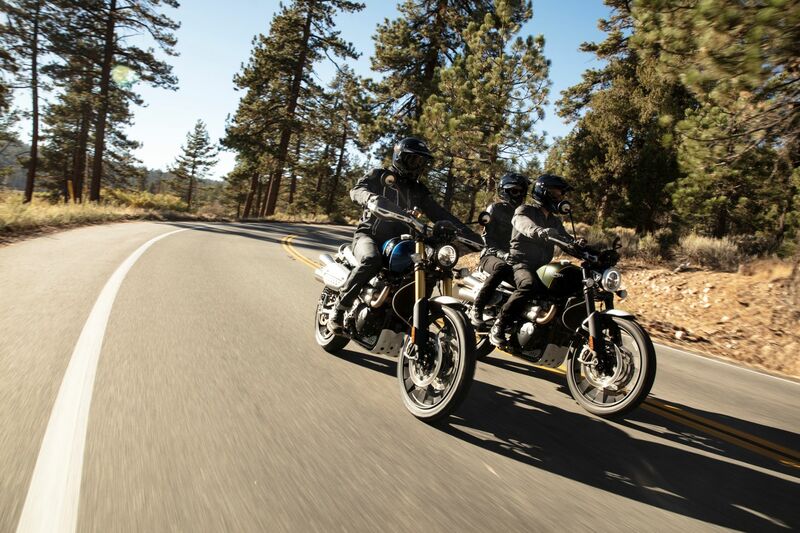 There are five riding modes; Road, Rain, Sport, Off-Road, and Rider-Configurable which you can customize in the Triumph app. As we mentioned earlier, the XE gets a sixth riding mode; Off-Road Pro. The difference between Off-Road and Off-Road Pro is that Off-Road Pro completely turns off ABS and traction control to maximize off-road fun. All-LED lighting, keyless ignition, USB charging, and cruise control round out the base package for both. 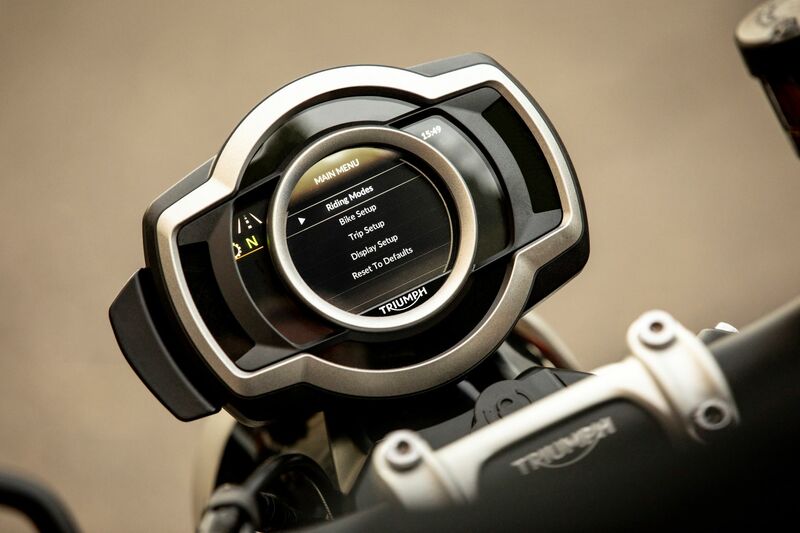 The Triumph Scrambler has a new TFT screen that looks like it will be one of the coolest ones on the market. It’s a fairly simple looking circular gauge pod with a ton of features packed in. There are the basics like a speedometer, odometer, and a fuel gauge, but the big news here is the navigation capabilities courtesy of Google in the tech giant's first collaboration with a motorcycle manufacturer. You can’t bring up a full map like you can on some fancier bikes, but turn by turn directions will pop up on the screen if you got a compatible device connected via Bluetooth. There's another special (and industry-first) tie-in you might want to know about: an integrated GoPro control system. 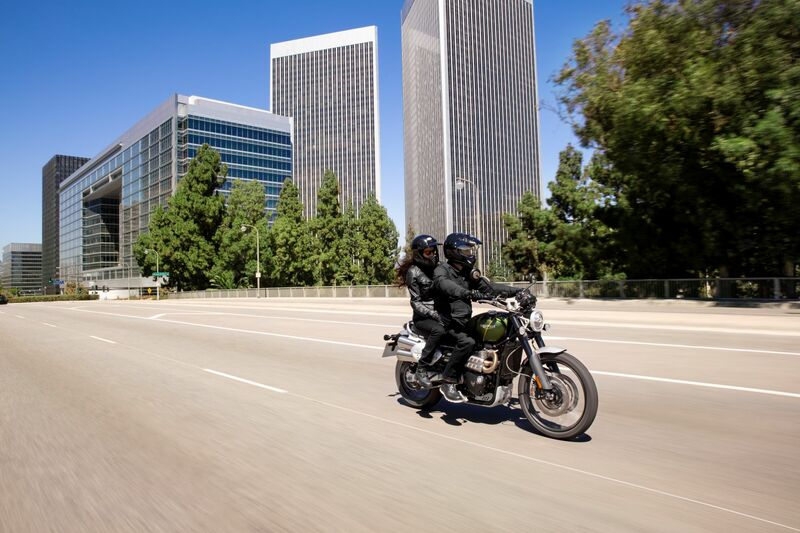 Using a GoPro while motorcycling can be a hassle when you need to reach for the camera while you’re riding. 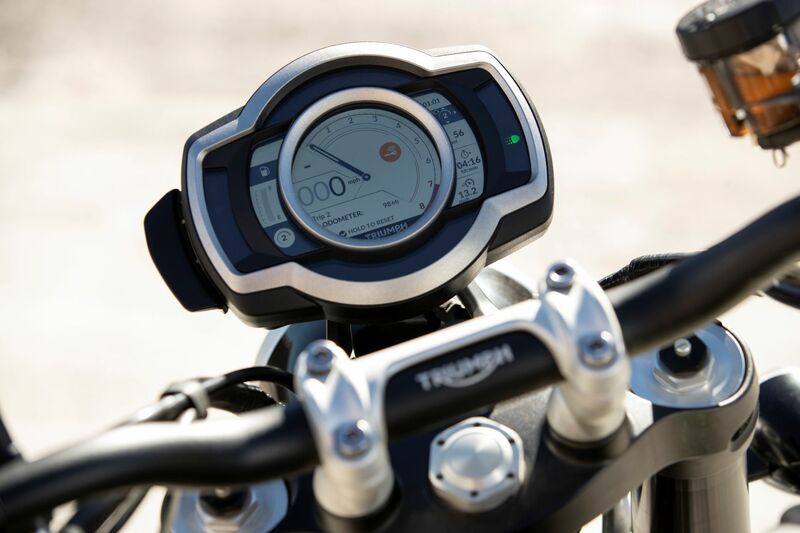 Triumph has solved that by integrating GoPro controls into the instruments of the Scrambler 1200. The connection and controls show up on the bike’s screen which can be controlled via the Scrambler’s switchgear. This optional feature will be a big deal for anyone who likes to record their rides. 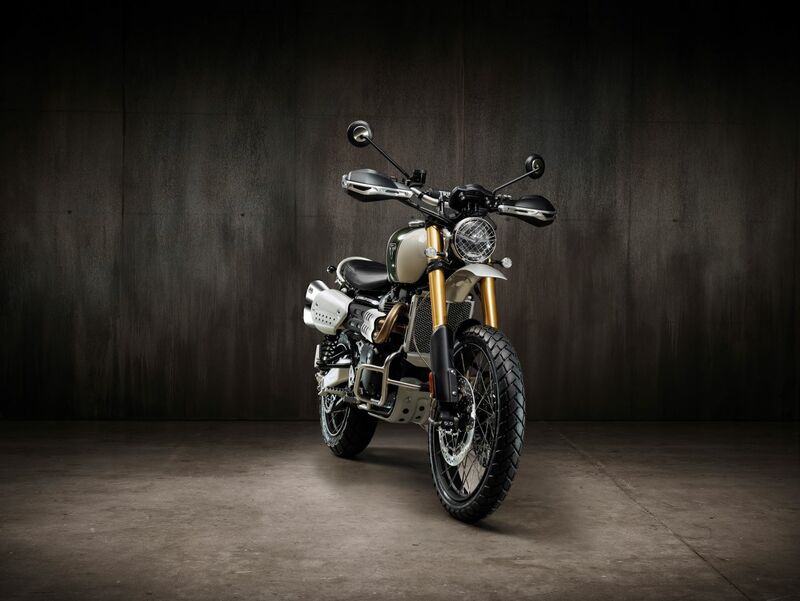 Like with the new Street Twin, the new Scrambler 1200 is available with two “inspiration kits” which are basically pre-packaged sets of accessories you can add to your bike. One is called “Escape” and has an adventure touring theme adding a pannier and fitting kit, a grab rack kit, LED fog lamps, a center stand, and a flyscreen. 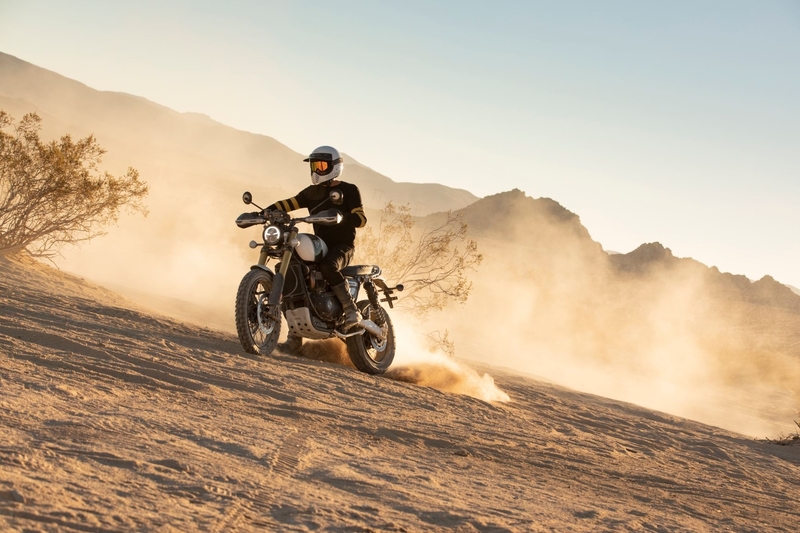 The other is called “Extreme” and makes the Scrambler a more aggressive off-roader by adding an Arrow carbon silencer, an aluminum radiator guard, a high front mudguard, a black handlebar brace, a headlight grille and bezel, and more. What You Need to Know: Adventure bikes seem to be getting more popular all the time and the new Scrambler 1200 puts a new spin on the form. 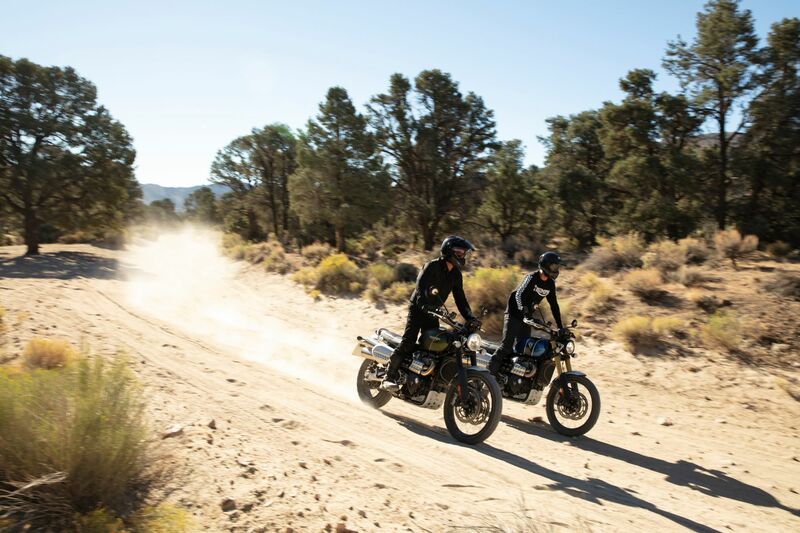 We’ve seen Triumph Scramblers before that are little more than off-roady Bonnevilles, but these new ones take that idea a step further with some new ideas. The big difference is the distinct retro inspiration that nobody else has really tried yet in the ADV segment, at least not in this size—plus all that new tech Triumph is bringing to the table. 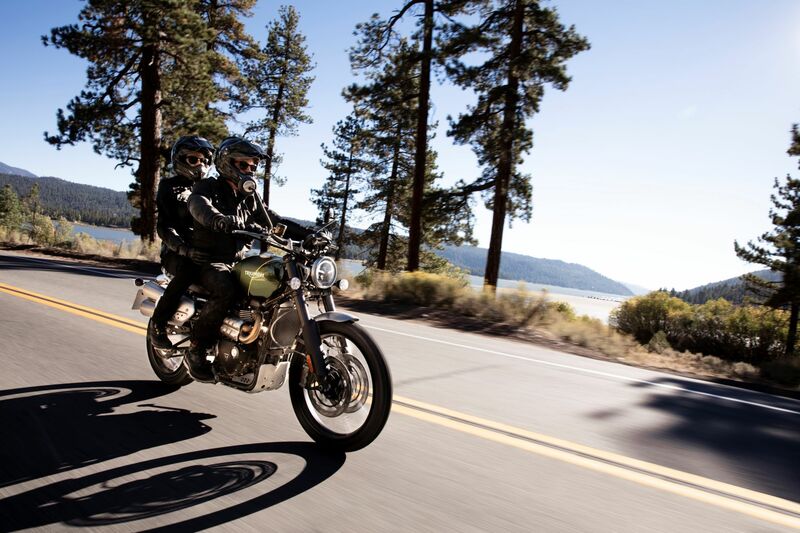 Pricing for the new Triumph Scrambler 1200 XC and 1200 XE will be announced on December 14.